Every year for the Annual Craftman's Fair at Mt. Sunapee Resort in NH, I participate in CraftWear ( which I do the exhibition layout), Living with Crafts, Sculpture Garden and a booth. Generally, doing the Sculpture Garden forces me way out of my comfort zone, since instead of working on a small scale ( under a foot), I have to go up 3-6 ft big. Last year, I did a 6'4" bird woman sculpture, which was huge for me. This year, I though I would blow up one of my nail hedgie birds and make a big one. Well, by the time I got finished welding, bird was 5'7 long. I always have to keep the size manageable, for anything I make has to fit in my compact car. Bird just manages to fit in my car, laying down. He looks like a dinosaur bird so I've nicknamed him DinoBird. He's glaring at me as I type this! Last night, my mom and I went to see the local fireworks that Manchester usually puts on. At the local Lowes and Targets in Bedford, they are situated on a hill, in Bedford Highlands, so high, you can look down on Manchester, so I thought it would be a good vantage point to watch the fireworks. Much to my surprise, I not only saw Manchester's fireworks, but 5 separate displays from other towns. I guess my vantage point must have been that high. I wasn't the only one, quite a few of the locals camped out in the parking lot and watched as well. Last but not least, I have a new dog, Hercules. 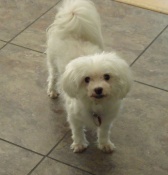 He was a sadly ignored Maltese that needed a new home, so he came from Philly. I thought Hercules would make a good companion for Bosco, my other dog, but it's a really interesting relationship the two boys have. Poor Hercules doesn't quite know how to be a dog, and acts like a little boy much of the time. Bosco is like this little old man, and acts just like an old man even thru he's two years younger than Hercules. Bosco makes me laugh a lot and he's my faithful companion. I'm still working on Hercules to get him more comfortable. I got a crash course in learning to shave and trim dogs - took 4 trimmings to get Hercules to look decent.